LAKE ELSINORE (July 16, 2016) — The American Red Cross serving Riverside County was called out to assist residents of the Briarwood Mobile Home Park immediately following a multi-home fire on Sat. July 16. Red Cross volunteers Becky, Nico and Susan arrived to find three homes totally destroyed and 12 people left to pick up the pieces. The volunteers worked quickly to help these families begin the difficult task of recovery. Seven times a day someone in this country dies in a home fire. Countless others suffer injuries. 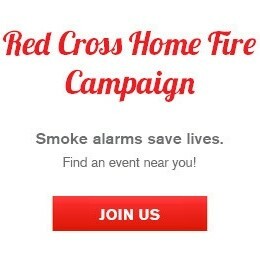 To combat these tragic statistics, the Red Cross has launched a nationwide campaign to reduce the number of deaths and injuries due to home fires by 25 percent by the end of 2019. The Home Fire Campaign is happening all over the country and involves Red Cross workers joining with local fire departments and community groups to visit neighborhoods at high risk for fires. Those visits include educating people about fire safety through door-to-door visits and installation of smoke alarms in some of these neighborhoods. Our Home Fire Campaign event will be held on Saturday, July 30, 2016 at Briarwood Mobile Home Park at 300 N. Ellis St., Lake Elsinore, Calif., 92530 at 8:00 a.m. Interested volunteers can contact Ernie Calderon at (888) 831-0031 ext. 2018. No experience necessary, training will be provided at the day of the event. The Red Cross is asking everyone to take two simple steps that can save lives: check their existing smoke alarms and practice fire drills at home. The Red Cross responds to nearly 66,000 disasters each year in the United States and the vast majority of those are home fires. You can help by donating to Red Cross Disaster Relief by visiting redcross.org, calling 1-800-RED CROSS or texting the word REDCROSS to 90999 to make a $10 donation. Donations to Disaster Relief will be used to prepare for, respond to and help people recover from disasters big and small.